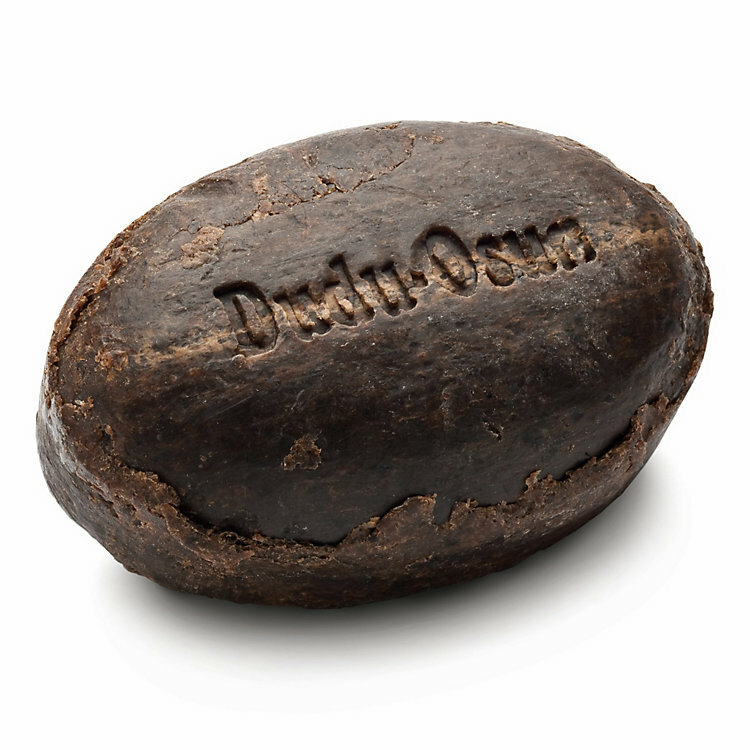 The black soap is suitable for all skin types, and the perfume-free Dudu-Osun® is especially recommended for sensitive skin. Made in Nigeria. The palm oil also comes from Nigerian small scale farmers who cultivate the oil palms with traditional methods. A Certified Natural Cosmetic. Black Soap. For Skin and Hair. The basic ingredient of the tradition-rich Dudu-Osun®, a black soap, is shea butter, also known as carité butter. Black soap is used throughout West Africa for a gentle, but effective wash of skin and hair. Black palm oil plus the ashes from palm kernels and cocoa fruits give the soap its dark colour, while lemon juice, lime extract, and African sandalwood (Camwood) give it a distinctive earthy scent. The shea butter and aloe vera extracts nourish and lubricate the skin. Black soap gently cleanses facial and body skin deep into the pores, combining the qualities of a peeling, a wash lotion and a cream. Black soap can also be used as a shaving soap. Or even a facial mask: just apply the soft soap foam in a thin layer, let it dry and rinse it off. Nourishing with vitamins and unsaturated fatty acids. The shea nut tree grows in the West African savannahs and plays a significant economic role in Africa. Attempts to cultivate the tree which only reaches full maturity in about 50 years have not been successful to date. Therefore when forests are cleared for new fields, the shea nut trees are left standing and protected and cultivated in so-called tree parks. The shea nut tree bears fruit once a year whose fat enriched nuts are used to produce the carité butter. The butter has excellent nourishing characteristics and is also rich in vitamin E and provitamin A and unsaturated fatty acids. Used as a cream, shea butter provides the skin with moisture, keeping it smooth and supple.